Transform your pool into the outdoor oasis of your dreams with custom pool features. These various options add a touch of luxury to your poolscape. Add a touch of luxury to any of our pools with a tanning ledge, complete with lounge chairs. Lighting can add a whole new ambiance to your poolscape. You can highlight your pool with colored LED lighting and can program the lights to change colors or remain a constant color. The sky is really the limit! Create the best of both worlds by adding a spa to your poolside. Then create a water spillover that creates a natural waterfall! 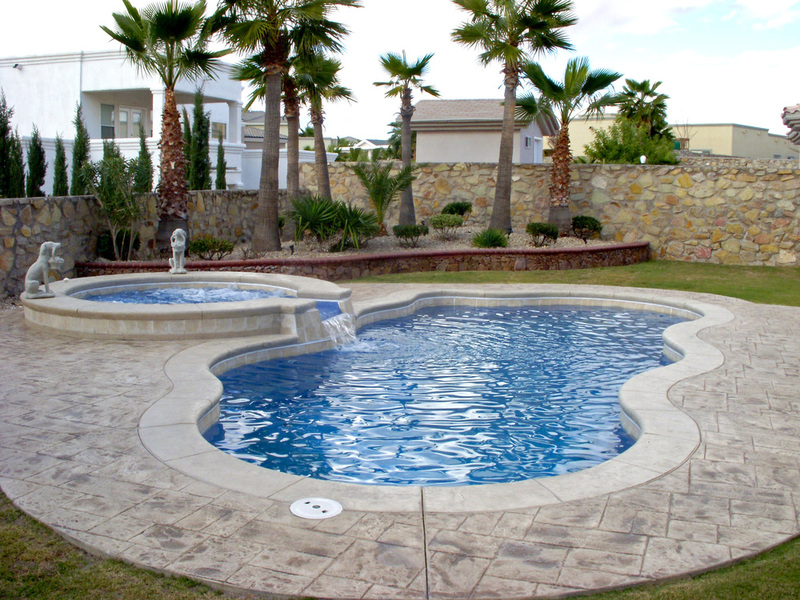 This feature is the perfect way to add a touch of luxury to any swimming pool. 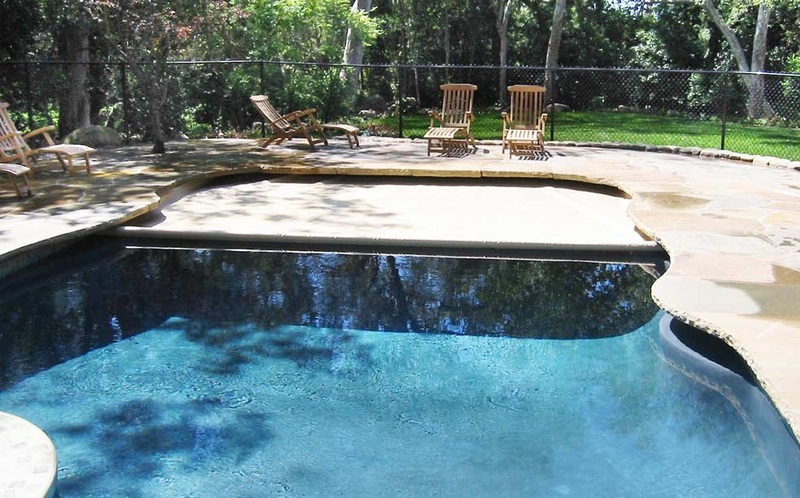 Concrete is the most common pool deck option because of its affordability and durability. Our expert installation team can add a sense of beauty to concrete by staining and stamping it to look more like stone, brick or tile. Cascades and deck jets bring an elegant touch to your poolscape, while adding the soothing sound of falling water. With today's technology, a variety of options are available, from simple to ornate. A pool cover is a valuable tool for maintaining your outdoor oasis, as they provide a number of benefits. In addition to keeping dirt and leaves out of your pool, they provide an element of safety by isolating the water, making it less enticing for curious children and pets. Some covers are even strong enough to hold the weight of several people. Covers also significantly reduce heating costs, chemical use, energy usage and evaporation. Coverstar’s automatic pool cover helps reduce water evaporation and heat loss up to 70 percent. This cover will also keep pool chemicals from dissipating, resulting in electricity savings by reducing the number of filtration cycles. Click here to learn more about products providing energy efficiency. Add a sense of fun and entertainment to your pool with a diving board and pool slide. 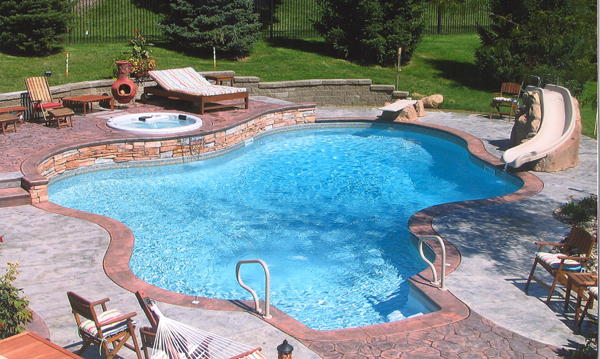 With a wide variety of options, Shawnee Pools has the perfect solution for every pool. Turn your pool into a recreational hotspot by adding accessories to facilitate basketball and volleyball games. Heat pumps allow you to enjoy your pool more often by keeping the water at constant temperatures. Pool heaters provide quick heat-up for weekend parties and work in any outside temperature. Shawnee Pools offers a wide variety of pool cleaners to keep your pool operating at its best performance. Our automatic pool cleaners provide energy efficiency, at just 5 cents an hour to operate, while cleaning your pool, floor, walls and waterline. Our variable rate pumps provide energy savings – up to 90 percent over traditional pumps – and are simple to use and program. Click here to learn more about products providing energy efficiency. A tanning ledge provides an area with a shallow, consistent depth that’s a perfect place for basking in the sun, and for children playing. We also have a variety of ledge lounger chairs made with durable materials that you can use near, and inside, your pool. We partner with LightStream to provide competitive pool financing.